← Did You Find The Man Selling Ham? Arlington Avenue was my 12-year-old self’s paradise. There, I found a place of supreme delight. At Cross My Heart, Jet, Sue and Susan’s retail shop for counted thread patterns and supplies, the walls were lined with rows upon rows of cross-stitch graphs and tidy lineups of hundreds of shades of DMC embroidery floss. Orderly bins of packaged Aida, linen and evenweave fabrics stood on its polished wooden floors. Finished samples of patterns — stitched by hooked customers like me in exchange for store credit — offered countless tempting ideas for future projects. I was such a fixture at Cross My Heart that I soon figured out a future that would put me on this street at the center of my universe. I’d live in one of the apartments across the way and work at the Miller Park branch of the Upper Arlington Public Library. I’d be close enough to make frequent runs to the Tremont Goodie Shop for Paradise coffee cakes and iced soft chocolate cookies, and to dine on Chicken Kiev at Delikatesa in the Lane Avenue Shopping Center. And I’d be right by Baldridge Road. Paradise! Arlington Avenue now offers a similar paradise to my 48-year-old self. It’s now the home of Cover to Cover, the city’s first and foremost independent bookstore devoted exclusively to children’s titles. Cover to Cover was established in 1980 by Salli Oddi, a former Columbus Public Schools elementary school teacher. She and two other teachers began by traveling to area schools to sell popular paperbacks to students during book fairs, those fund-raising enterprises in which the bookseller shares the profits with the school. 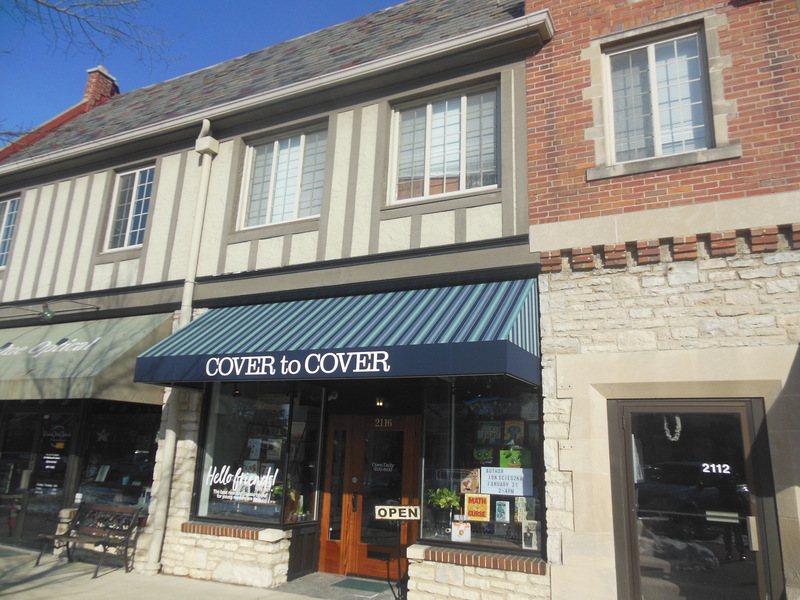 First located in Clintonville, Cover to Cover moved up North High Street to a larger location in 1997, where it remained until last summer. Oddi used her knowledge of children’s books that she gained as an educator and a parent to create a phenomenal inventory of award-winning children’s books, New York Times best-sellers, and selections focused on parenting and education. Customers also recommended titles for the store to carry. Oddi also offered regular children’s storytimes, reading clubs, writing workshops, teacher-training sessions, and visits by hundreds of children’s authors and illustrators. Jan Brett, Virginia Hamilton, Tomie DePaola and Marc Brown are just some of the notable figures who visited Cover to Cover to sign books, read stories to children, and draw autographed pictures on one of the store’s walls. 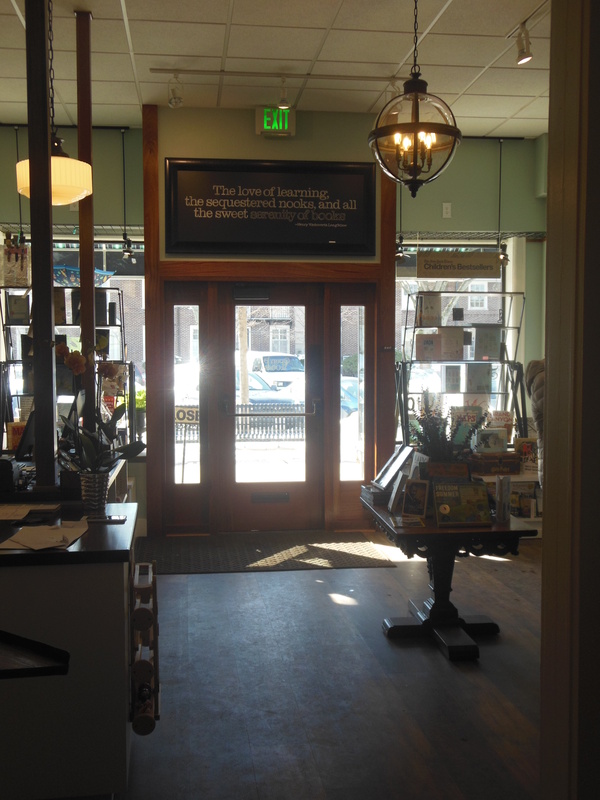 The warm, inviting store created a devoted following among children, parents, teachers and lovers of children’s literature. Its proximity to the Ohio State University campus also attracted education students learning techniques of literature-based instruction, in which children read trade books along with classroom study. When Oddi decided to retire last year, Melia Wolf bought the business to continue offering the very best of classic and new literature for young readers. In her new Upper Arlington location, which opened in January, Melia plans to continue Cover to Cover’s traditions, holding storytimes in the back of the store and hosting author visits around the corner in Jones Middle School’s auditorium. To put together her initial order of books, Melia worked with publishers and relied on Oddi’s inventory lists of middle-grade and picture books that reflect diversity, build empathy, and inspire children to become lifelong learners. Customers are still invited and encouraged to suggest books for Melia to carry. The former art educator, preschool teacher and puppeteer renovated the space to make it accessible to customers with disabilities. 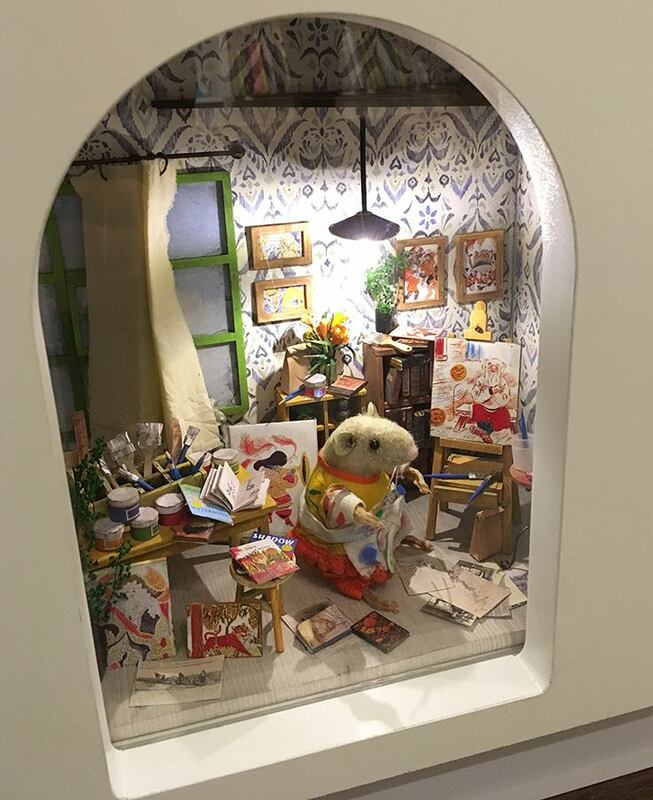 From an inviting color scheme and attractive displays to shelves filled with bronze mice holding customer book recommendations and an updated logo branding complimentary bookmarks and reading club cards, Melia’s artistic touches are everywhere. The store’s iconic autographed panels now top two bookcases. 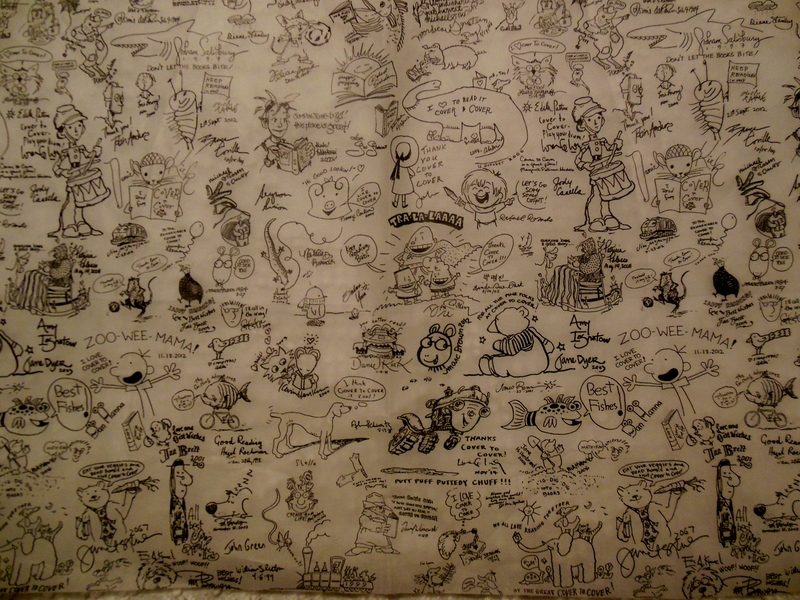 Images of the signed drawings also adorn gift-wrapping tissue paper and endpapers for a guest book Melia established for visiting authors and artists to sign. New York Times best-selling author Jon Scieszka, creator of The Stinky Cheese Man and Other Fairly Stupid Tales, The True Story of the 3 Little Pigs!, and the Frank Einstein series, inaugurated the book during his January 21 visit. Near the floor by the checkout counter, local artist Sharon Dorsey created two charming little hideaways inhabited by Caldecott and Newbery, two soft-sculpture mice named for the annual awards bestowed on the artist and author of the most distinguished contribution to American literature for children. Cover to Cover also sells notecards created by local artists with disabilities at Open Door Art Studio, which empowers the disabled to develop their artistic and creative talents. I might have stopped by the new Cover to Cover because of the store’s name, but I’ll continue to visit because of Melia. This entry was posted in Books, Columbus, Shopping. Bookmark the permalink. Me, too. Melia has infused her personality, talent, and love of books here. I drive from Gahanna to shop here.